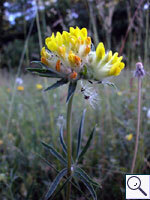 Kidney Vetch (A. vulneraria), is the only native species of Anthyllis recorded in Britain. There are several native and introduced subspecies including the introduced species including Bladder Vetch (A. tetraphylla). The BSBI provide a downloadable plant crib for Anthyllis. Eleven British miners are recorded on Anthyllis. A key to the European miners recorded on Anthyllis is provided in Bladmineerders van Europa. 1a > Leaf-miner: Linear mine in sepals and leaves (Spencer, 1972b: 88, as vulnerariae ; Spencer, 1990: 125). A corridor, largely lower-surface, often following a vein. In the end a short upper-surface corridor or small blotch. Pupation outside the mine (Bladmineerders van Europa). On Anthyllis in Britain and this and other Fabaceae elsewhere. Known only from Devon in Britain and continental Europe. Phytomyza brischkei Hendel, 1922 [Diptera: Agromyzidae]. 1b > Leaf-miner: Mine in leaf. Polyphagous. On more than 40 host genera in 15 families, but not yet on Anthyllis, in Britain,. Widespread throughout Britain. Also recorded in the Republic of Ireland. Widespread in continental Europe. 2b > Leaf-miner: Corridor leaf-mine in leaves. An upper surface linear mine with frass in conspicuous greenish strips, largely alternating at each side of the channel (Spencer, 1976: 241). Upper-surface, unbranched corridor, relatively broad from the start on, but only weakly widening subsequently. The fresh mine is bright green, but turns whitish, later brown, quickly. Frass in a wide green band in the centre of the corridor, with small black granules at either side. Pupation outside the mine (Bladmineerders van Europa). Forms an upper surface mine, with the frass in a green strips (British leafminers). Liriomyza congesta (Becker, 1903) [Diptera: Agromyzidae]. 2c > Leaf-miner: A narrow linear mine adjoining the leaf margin in the first instar, which later develops into an irregular blotch with conspicuous lumps of greenish frass (Spencer, 1976: 302). The first instar larva makes a narrow upper-surface corridor along the leaf margin. After it has moulted it begins a large upper-surface blotch. Frass in conspicuous green lumps, that can run out irregularly. Pupation outside the mine (Bladmineerders van Europa). Forms a narrow linear mine by the margin of the leaf which later develops into a blotch. The blotch has clumps of greenish frass (British leafminers). On Astragalus and Colutea, but not yet on Anthyllis, in Britain and Anthyllis, Astragalus, Cicer, Colutea, Coronilla, Cytisus, Lathyrus, Oxytropis, Securinega and Vicia elsewhere. Widespread in continental Europe. Phytoliriomyza variegata (Meigen, 1830) [Diptera: Agromyzidae]. 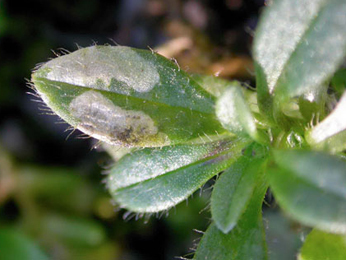 2d > Leaf-miner: A short, irregular, linear upper surface mine on any part of the leaf. Also recorded from young pods (Bland, 1997a). Polyphagous. On 119 plant genera in 31 plant families of which only 4 plant genera in 2 plant families, but not yet on Anthyllis, in Britain. Local, probably introduced to Britain. Widespread in continental Europe particularly in Botanical Gardens and glasshouses. Also recorded in Egypt. 2e > Leaf-miner: The mine starts as a long, narrow, winding corridor running towards the midrib, widening to a blotch. Usually upper-surface, but in small leaves also full-depth parts may occur. The blotch has broad lobes; in their ends most frass is accumulated in the form of green patches or clouds. Sometimes several larvae share mine. Pupation usually in the soil, less often in the leaf (and then generally not in the mine itself but in a small separated mine, that may even be made in the petiole) (Bladmineerders van Europa). 2f > Leaf-miner: Corridor-blotch mine, normally dorsal; usually whitish; in small leaves it lies characteristically in the centre of the leaf often touching the petiole; in larger leaves it lies to one side of the mid-rib. Frass deposited in green clumps near the leaf margin. Pupation usually external, sometimes in a separate pupation mine. Polyphagous. On numerous genera of Brassicaceae, Asteraceae, Papaveraceae, Resedaceae, Tropaeolaceae and Violaceae, including Alliaria, Barbarea, Brassica, Cheiranthus, Cochlearia, Coincyia, Conringia, Diplotaxis, ? Eruca, Erysimum, ? Hesperis. Lepidium, Matthiola, Raphanus, ? Rorippa and Sinapis, but not yet on Anthyllis, in Britain. On additional genera of these families and Fabaceae elsewhere. Widespread, from Caithness in the north to Cornwall in the south of Britain. Also recorded in the Republic of Ireland, Europe, the East Palaearctic, Near East and Neartic Region. 2g > Leaf-miner: Larva producing a short narrow linear mine not associated with the margin, which then develops into a conspicuous white blotch centred on the mid-rib. At the end of feeding the larva lies for one or two days along the mid-rib. Pupation external (Spencer, 1972b: 37 (fig. 114b); Spencer, 1976: 126, fig. 213A). Broad and short hook-like upper-surface corridor, ending in a little blotch in the centre of a leaflet. The blotch is upper-surface as well, but has some deep spots, giving the mine a mottled appearance when hold against the light. Frass in the blotch in a few large lumps. Pupation outside the mine (Bladmineerders van Europa). A short, broad gallery leading to a conspicuous, roundish white blotch in the centre of the leaf. The blotch is upper surface with full depth spots - comprising of large clumps of frass (British leafminers). On Medicago, Melilotus and Trifolium, but not yet on Anthyllis, in Britain and in addition other genera of Fabaceae elsewhere. Common and widely distributed in England. Also recorded in the Republic of Ireland. Widespread and common throughout Europe. Agromyza nana Meigen, 1830 [Diptera: Agromyzidae]. 1a > Leaf-miner: The first generation initially forms an unmistakable leaf-mine on Anthyllis vulneraria, but the second generation feeds on the flowers. Feeding signs on other plants vary in appearance. 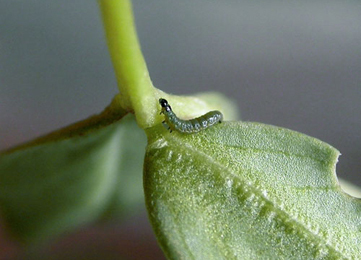 Larvae can move between sewn leaves, and more than one larva may be found together (UKMoths). Larvae in a small full depth blotch, often with extensions. Frass concentrated in one corner of the mine. The mining activities may cause the leaf to roll inwards. Older larvae live free among spun leaves, but still they may make then full depth mines by feeding on the leaf tissue from a small opening (Bladmineerders van Europa). On Anthyllis, Medicago, Onobrychis, Ononis and Trifolium in Britain and Anthyllis, Chamaecytisus, Coronilla, Cysisus, Dorycnium, Galega, Glycine, Hymenocarpus, Lathyrus, Lotus, Medicago, Melilotus, Onobrychis, Ononis, Ornithopus, Oxytropis, Phaseolus, Psoralea, Trifolium, Trigonella and Vicia elsewhere. Britain including the Channel Is. and Northern Ireland. Also recorded in the Republic of Ireland. Widespread in continental Europe. Aproaerema anthyllidella (Hübner, 1813) [Lepidoptera: Gelechiidae]. Polyphagous. On numerous genera and species of plant families, but not yet on Anthyllis, in Britain. On numerous genera and species of plant families including Anthyllis elsewhere. Widespread in Britain and continental Europe. Also recorded from the Channel Is. 1c > Leaf-miner: Oviposition on the leaf underside. The mine begins as a long corridor with a very broad, green frass line. This corridor suddenly widens into a broad blotch, that in the end may occupy almost an entire leaflet. The blotch generally begins in the leaf base, and it is here that most frass is concentrated. 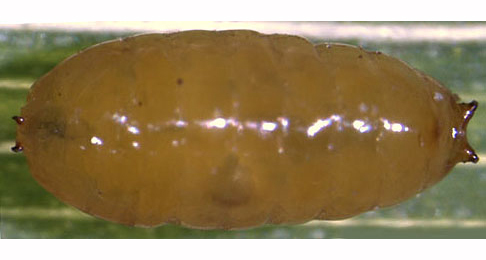 Shortly before pupation the larva leaves its mine through an exit slit in the lower epidermis. After the mine has been vacated the leaflet drops off. On Lotus corniculatus and Lotus pendunculatus, but not yet on Anthyllis, in Britain and Anthyllis, Coronilla, Hippocrepis, Lotus and Securigera elsewhere. Widespread in Britain. Also recorded in the Republic of Ireland. Widespread in continental Europe. Trifurcula cryptella (Stainton, 1856) [Lepidoptera: Nepticulidae].